Originally published under the title "Turkey: "We Need a Religious Constitution." Ismail Kahraman, speaker of Turkey's parliament, last week stated, "We are a Muslim country. That is why we need a religious constitution." Along with Erdogan, former president Abdullah Gul, and eight AKP heavyweights (mostly cabinet ministers), Kahraman comes from the ranks of the National Turkish Student Union (MTTB in its Turkish acronym). Another MTTB bigwig, Huseyin Velioglu, later formed what became the militant Islamist group "Turkish Hizbullah." Especially between 1965 and 1980, when a military coup administration dissolved it, the MTTB operated as the youth organization of Turkish political Islam. Kahraman, in late 1960s and early 1970s, was MTTB's president. His oath as parliamentary speaker requires his full loyalty to the "supremacy of law and to the democratic and secular republic." But his public speech on April 26 was totally against both his own oath of office and the constitution of the country where he serves -- presumably -- as an unbiased parliamentary speaker. 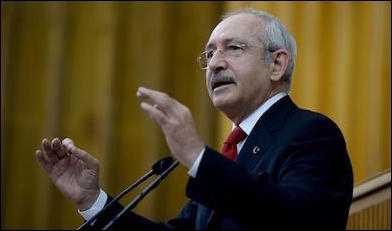 Republican People's Party leader Kemal Kilicdaroglu: "The chaos in the Middle East is the result of politics instrumentalizing religion." Although both President Erdogan and Prime Minister Ahmet Davutoglu denied any AKP plan to remove secularism from the new constitution that their specialists are now drafting, Kahraman's abrupt call for a religious constitution once again revealed Turkey's old political fault-line, now giving signs of shaking. This is a decades-old political war between the Turks who see the future of their country in Western civilization, including a secular constitution, and those who insist that Muslim Turkey belongs to the Middle East -- including, as Kahraman pointed out, a religious charter that contains the name Allah. Erdogan often defines his understanding of secularism as the state standing at an equal distance to all or no faith. In principle, he is right. 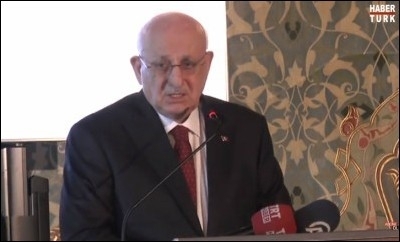 He expressed that view after Kahraman's controversial lines. But just saying this does not make him a secular politician. A recent ruling from the European Court of Human Rights (ECtHR) was the best proof that Erdogan's Turkey failed in fulfilling even his own definition of secularism (that the state is at an equal distance to all religious faiths). The ECtHR condemned Turkey for discriminating against members of the Alevi (Muslim) religious minority, by failing to grant their places of worship the same status and advantages as those of other faiths (Sunni Muslim). Alevis, who draw from Shiite, Sufi, and Anatolian folk traditions, account for about 15-20% of Turkey's 79 million people. Most Sunni Muslims view Alevis as heretics.